Currently, the average processing time for an I-526 petition ranges from 20.5 to 27 months, as shown in the screenshot from USCIS website below. For cases filed with an receipt date of January 29, 2017 or earlier that remain pending with USCIS, the investors or the attorneys of record can submit an “outside normal processing time” service request online or follow up with the Immigrant Investor Program office at USCIS.ImmigrantInvestorProgram@uscis.dhs.gov. .After the approval of the I-526 petitions, investors born in mainland China or Vietnam will need to wait until their priority dates become current before visa numbers are available to them. 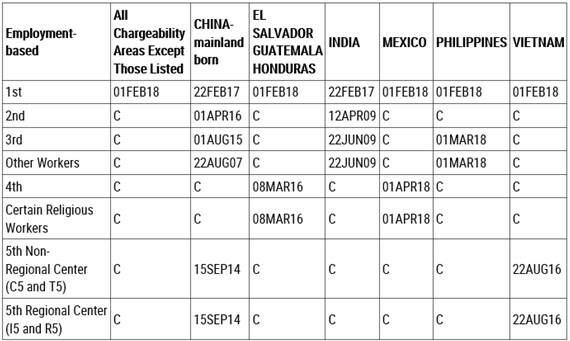 According to Department of State’s Visa Bulletin for April 2019, the Chart A (Final Action Dates) priority date cutoff dates are September 15, 2014 for mainland China-born investors and August 22, 2016 for Vietnam-born investors. This means Chinese investors with priority dates of September 15, 2014 or earlier and Vietnamese investors with priority dates of August 22, 2016 or earlier are now eligible to (1) be scheduled for immigrant visa interviews and issued immigrant visas should they pass the interviews, if they proceeded with consular processing and have previously submitted DS-260 application and civil documents and NVC confirmed case processing complete; (2) file adjustment of status application (AOS) if they are in valid status in the U.S.; (3) wait for the adjudication of their AOS application, if previously submitted. Typically, USCIS will ask that investors/attorneys allow 30 days after the priority date becomes current to submit an inquiry about the AOS application if no update (RFE or Approval Notice) is received for the case. Typically, the AOS application is adjudicated within a few months (if their AOS receipt date is prior to the receipt date for a case inquiry) after the priority date becomes current, at which time, an RFE will be issued for the Chinese and Vietnamese investors for a new I-693 medical examination as their previous ones have expired during the pendency of the applications. After a response to the RFE is filed, USCIS typically takes a few months in approving the AOS application and a conditional permanent resident card will typically be issued within a month after the approval. The current priority date cutoff date per Chart B (Dates for filing) of the Visa Bulletin is October 8, 2014 for mainland China-born Investors, moved up by one week from the March Visa Bulletin. The priority dates remain current for investors born in all other countries. This means that Chinese investors with a priority date of October 8, 2014 or earlier are eligible to pay fee bills and submit DS-260 applications, whereas investors born in all other countries are eligible to pay fee bills and submit their DS-260 applications, as soon as their I-526 petitions are approved and the cases are transferred to the NVC. It is important to note that, at times, USCIS allows filing of AOS applications based on Chart B of the visa bulletin – this is of particular benefit to Vietnamese investors who have valid nonimmigrant status in the U.S. and wish to process their green card application without leaving the U.S. 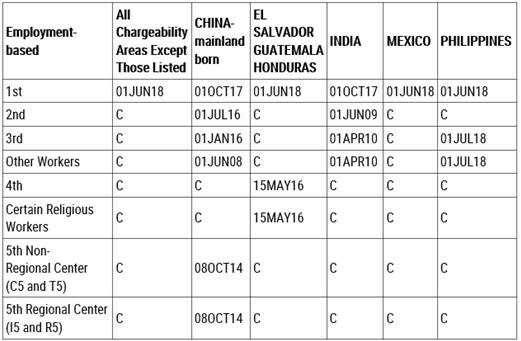 However, for the month of April 2019, USCIS does not permit the use of Chart B for filing AOS applications. We will closely monitor this and advise once USCIS allows the use of Chart B. Finally, the average processing time for an I-829 petition to remove the condition on the permanent residence ranges from 29.5 to 38.5 months, as shown in the screenshot from USCIS website below, though in practice, we have seen cases approved in much faster timeline. For cases filed with an receipt date of February 11, 2016 or earlier that remain pending with USCIS, the investors or the attorneys of record can submit an “outside normal processing time” service request online or follow up with the Immigrant Investor Program office at USCIS.ImmigrantInvestorProgram@uscis.dhs.gov.